The 276 Boundary Monuments along the U.S.-Mexico border recall a time when the countries were separated by dignified stone sentinels rather than walls, sensors, and cameras. SlideshowBorder Monument No. 2. N 31°47.032’ W -106°32.239' Mount Cristo Rey. Franklin Mountains in the distance. SlideshowBorder Monument No. 6. N 31°47.012’ W -106°49.517’ West of Santa Teresa Port of Entry. SlideshowBorder Monument No. 30. N 31°47.027’ W -107°53.597’ Near Josefa Ortéz de Domínguez. SlideshowBorder Monument No. 56 N 31°20.003’ W -108°20.632’ Dog Mountains. SlideshowBorder Monument No. 68 N 31°19.937’ W -108°53.918’ Animas Valley. SlideshowBorder Monument No. 72. N 31°19.940’ W -109°03.715’ Cerro Puerta Blanca and Cerro La Esperanza in the distance. SlideshowBorder Monument No. 85A. N 31°20.033’ W -109°34.447’ Agua Prieta, Sonora – Douglas, Arizona. SlideshowBorder Monument No. 87. N 31°20.055’ W -109°40.247’ West of Agua Prietoa, Sonora – Douglas, Arizona. SlideshowBorder Monument No. 92A. N 31°20.047’ W -109°56.583’ Naco. SlideshowBorder Monument No. 99. N 31°20.036’ W -110°12.536’ West of the San Pedro River. SlideshowBorder Monument No. 100. N 31°20.021’ W -110°15.598’ Huachuca Mountains, Coronado National Memorial. SlideshowBorder Monument No. 105. N 31°19.997’ W -110°23.437’ Llano La Bota. SlideshowBorder Monument No. 108. N 31°19.987’ W -110°30.323’ Bodie Canyon. SlideshowBorder Monument No. 118. N 31°20.024’ W -110°50.866’ Santa Cruz River. SlideshowBorder Monument No. 119. N 31°19.991’ W -110°54.105’ East of Nogales. SlideshowBorder Monument No. 122A. N 31°19.965’ W -110°56.841’ Overlooking Fundó Legal Heroica neighborhood, central Nogales. SlideshowBorder Monument No. 124. N 31°19.960’ W -110°56.638’ Mariposa Canyon, Pajaríto Mountains. SlideshowBorder Monument No. 138. N 31°28.239’ W -111°30.375’ East of Arroyo del Sasabe. SlideshowBorder Monument No. 153. N 31°41.536’ W -112°12.522’ Sierra La Alesna. SlideshowBorder Monument No. 163. N 31°49.367’ W -112°37.832’ Sierra De Santa Rosa, overlooking Sonoyta Valley and Organ Pipe National Monument. SlideshowBorder Monument No. 170. N 31°54.987’ W -112°56.353’ La Abra Plain. SlideshowBorder Monument No. 185. N 32°10.182’ W -113°45.079’ Tule Mountains. SlideshowBorder Monument No. 191. N 32°15.630’ W -114°02.681’ Tinajas Altus Mountains. SlideshowBorder Monument No. 194. N 32°18.257’ W -114°11.212’ Yuma Desert – Deserto de Altar. SlideshowBorder Monument No. 207. N 32°43.082’ W -114°43.890’ Los Algodonoes, Baja California. West of Andrade Port of Entry. SlideshowBorder Monument No. 222. N 32°39.527’ W -115°34.855’ Near Centinela, Mexicali, Baja California. SlideshowBorder Monument No. 230. N 32°37.549’ W -116°00.738’ Jacumba Mountains overlooking Pinto Canyon. SlideshowBorder Monument No. 239. N 32°35.477’ W -116°26.757’ Near Campo, California. SlideshowBorder Monument No. 250. N 32°33.720’ W -116°42.983’ Cañon el Padre. SlideshowBorder Monument No. 255. N 32°32.563’ W -117°01.627’ Tijuana – San Ysidro railroad crossing and customs area. The first principle of an essay, photographic or written, is to frame your terms. So let’s start with boundary, which most dictionaries describe as a dividing line, or perhaps a line that defines the limits of (i.e., that bounds) an area. Yet, by definition, there are two sides to every line, every boundary, every border. That last term, border, is most often taken to mean a line separating two political areas; thus, ineluctably, lines and boundaries and borders also connect two sides. The relationship between a boundary and a story is not necessarily causal, but it is notable that we say “all stories have two sides.” So a story can be taken as a kind of boundary: between the past and the present, or the present and the future, or between what we call the real and the fictional. And we often say that the separation between two perceived states of reality — for example, between a truth and a lie — is blurred, that it’s less a line than a zone, a gray area. This is more than a metaphor; as with perceived reality, geographical borders are less lines of separation than zones of transaction. In terms of cognition in the animal kingdom, life is all about boundary and contrast. Once an organism other than a plant can sort out the difference between light and dark — an ability that first arose in jellyfish around 700 million years ago — evolution turns to the perception of shapes. Shapes are defined by lines, by what is inside and outside a bounded line, which is to say the outline of an area or a figure. To see the outline of something other than oneself is basic to both eating and not being eaten. A great deal of metabolic energy, often via the brain and the cognitive systems of most animals, is spent on sorting out boundary contrasts. Borders are almost entirely situational, as much gray area as a sharp delineation. All these terms and definitions have bearing on David Taylor’s work along the Mexico-United States border, or the United States-Mexico border, whichever you deem more relevant, a status that may depend simply on which side of the boundary you are standing. Boundaries and borders are almost entirely situational, their necessity, legality, even legibility dependent on where you are in time and space in relationship to the line; they are as much fiction as reality, as much a gray area as a sharp delineation. This is not to say that such things as clear lines can’t exist — they do. It’s just that borders, which at one hour may be impassable and deadly, can later in the same day suddenly be open to smugglers or spies or politicians or housewives. It just depends on the circumstances. I don’t want to be clever or obtuse in laying out these words and definitions, but rather to indicate how profound and rich an endeavor is Taylor’s work along the border, which he started in 2007. His earlier photographic project, Working the Line, includes images of both selected monuments and the environment of the border — the desert, the border towns, the law enforcement facilities and personnel, the housewives. In a similar spirit, the Monuments project is not just about the six-foot-high obelisks that mark the border — the 276 Boundary Monuments constructed by the International Boundary Commission in the last half of the 19th century from El Paso-Juárez to San Diego-Tijuana — but is embedded more broadly in the larger artistic practice of border investigations. The monuments stand sentinel among the voyagers, and the border retains its dignity because it is not dominated by fear. One of the reflections promoted specifically by Taylor’s Monuments is that it documents what are actually points on a two-dimensional surface that, when linked through politics and history and surveying instruments, form a line. The points themselves are not adjacent. They are carefully spaced so that you can see those immediately to the east and west of your position, and then can mentally construct a model of a line in your head. It is elegant to experience at geographic scale discrete points played out with such economy to form a line. In terms of human cognition, not to mention classical Greek geometry, it seems a shame to sully this purity with an actual wall, an impossible attempt to make a political border permanently impermeable. The difference for the viewer between the points and the line are acute; the monuments by themselves have a visible dignity. When the obelisks are subsumed by the presence of an actual barrier, they are diminished, sometimes becoming pathetic or cruelly comical. When the border is delineated by separate points, the flow of humans, plants, and animals is unimpeded, even as a boundary has been demarcated. The monuments stand sentinel among the voyagers, and the border retains its dignity because it is not dominated by fear. The use of boundary stones is as old as the earliest urbanizations, the cities of Mesopotamia, the Indus Valley, and Egypt. When the Romans later used them across Europe, they had developed into multipurpose markers called termini; these reflected civil authority, referenced historical events, cued local geographic features, and invoked deities. If you moved or destroyed a boundary stone without permission, you risked not only civil penalties but the wrath of the local spirits. In recent years the gaps between the monuments along the U.S.-Mexico border have been filled intermittently with fences and walls in an attempt to definitively control movement in either direction. The history of such physical barriers has been varied. There was the seventy-three-mile-long Hadrian’s Wall, begun in A.D. 122 by the Romans, which, according to conventional history, was meant to keep the Picts at bay. 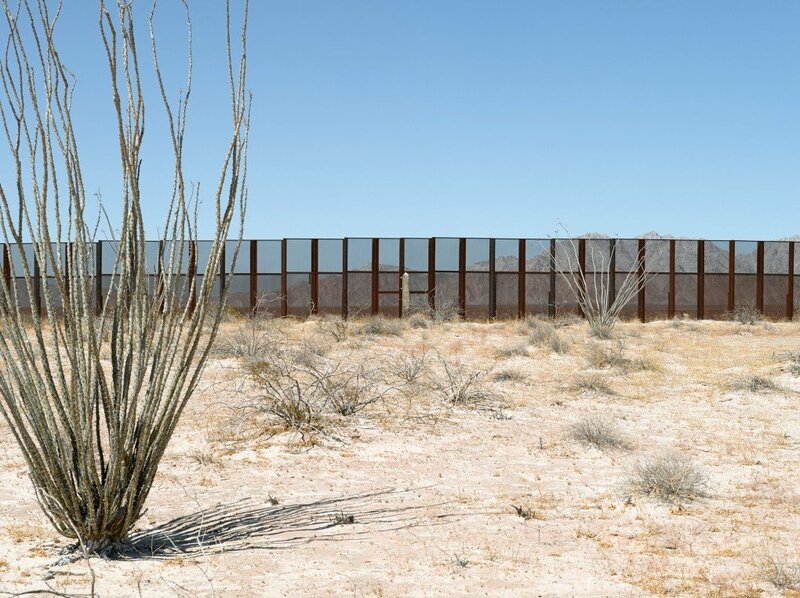 (A more logical theory befitting the economics of the region is that the wall was built to control smuggling and to derive tariffs from regulated commerce.) There was the mid-19th-century Great Hedge of India, a 1,500-mile-long wall of greenery built by the British to facilitate the taxation of salt. There were the multiple Great Walls of China, which in fact had only a little to do with stopping invaders from the northern steppes and instead served to set up profitable trade differentials. The thick fortifications were as much a long, thin city as anything else, in the literal shadows of which resided garrisons, forts, farming communities, trading posts, and manufacturing towns. A wall is an impossible attempt to make a political border permanently impermeable. Walls continue to be erected in order to make borders less penetrable. While the Berlin Wall failed in a remarkably short time, no one can guess how long the multilayered Israeli West Bank barrier — which will eventually be 430 miles long — may last. Among the world’s newest barriers is the one Bulgaria is erecting along its border with Turkey, an attempt to stanch the flow of refugees from war in Syria. Eventually, the fence will run approximately 160 kilometers, with guards posted every one hundred meters to be in sight of one another, as if they themselves were monuments. Bulgarian officials admit that refugees will simply find their way to the ends of the fence. And of course, in the midst of the latest migrant and refugee crises, still more European countries are working to seal their borders with unwelcoming barriers. The legally defined U.S.-Mexico border region extends sixty kilometers north and south of the surveyed line — thirty-seven miles in each direction, a seventy-four-mile-wide ecotone running from the Gulf of Mexico to the Pacific Ocean. Ecotones are places where two environmental regimes meet and exchange occurs. They contain higher diversity of species, and of numbers of animals within species, than separate ecozones, a condition called the edge effect. Ecotones are thus rich with life, which creates opportunities for predation. An edge effect can be created by something as simple as the shadow line of mountains cast on Alaska’s tundra, where raptors patrol the edge for small mammals coming out of the trees to forage in the open areas. Or by something as complex as a border fence, where the Border Patrol, coyotes, and the self-proclaimed Minutemen militia all prowl. A line marking national sovereignty is something of a myth: a story politely accepted by both sides and then constantly reaffirmed through negotiation. A line marking national sovereignty is already something of a myth: a story that initially must be politely accepted by both sides and then constantly reaffirmed through negotiation. When the disparity between what is on the two sides of the line becomes too great — economically, environmentally, politically — people attempt to relieve the disparity by crossing. And that’s when governments begin to erect physical walls, out of fear. But a border becomes difficult to sustain when it is tasked with being a barrier, which is a very different entity. When this happens, the borderlands become a human ecotone that falls prey to every kind of subterfuge as people seek to foil that barrier. Perhaps the only way to comment intelligibly on the photographic documentation of a border, therefore, is to admit that it belongs as much to studies in landscape ecology as to art. A photographic series made along a border admits of complexity, of systems thinking, of the necessity to bring different disciplines together to make sense out of what you’re seeing. And it requires us to acknowledge that the photographer changes the border as he or she photographs it, and vice versa. Czech photographer Josef Koudelka photographed Israeli and Palestinian landscapes from 2008 to 2011 as the barrier was erected between the two regions. In the resulting book, titled Wall, his high-contrast black-and-white photographs are so stark that they read like bullet-pocked, apocalyptic, unapologetic documents of a future that couldn’t possibly coexist with the present — and yet it does. Koudelka, when interviewed about this project by The New York Times, noted that “a photographer works on the subject, but the subject works on the photographer.” The corollary is that we, as viewers, are changing the nature of the border as we look at the images — and that the images change us. Taylor’s interactions with members of the U.S. Border Patrol while working along the line inevitably made some of those individuals view where they work in a new light. Residents observing Taylor while he worked also looked more closely at the monuments in their neighborhoods, actually seeing them for the first time in years. Viewers of the photographs will remember how the monuments are sometimes next to corrugated-metal wall panels and sometimes planted in the middle of a landscape with no clear reference to a border other than themselves. You come away from the images with a strange fervor to see more. You begin to question the nature of the border, the boundary, the supposed impenetrability of a barrier. You think about the fact that seven million Americans — six percent of all American households — have willingly imprisoned themselves behind residential compounds walls. The work of Taylor and Koudelka and other photographers and writers working the borders will, over time, change not only how we see those borders, but also the policies that attempt to enforce them. Taylor’s compilation of monument images serves as a focusing device for this larger subject matter; so too does the rich archive of materials that he collected along the way. The 19th-century maps and surveys and photos behind the slow evolution of the physical border during the 20th century; remnants from coyote incursions, Border Patrol leftovers, and camping detritus of the vigilante Minutemen; a typology of slippers worn by immigrants seeking to erase their footprints in the sand — all this and much more form a comprehensive record of the ecotone. David Taylor’s border works are massive, covering long stretches of time and space. Few artists have devoted anywhere near the amount of their lives to traveling along, contemplating, documenting, and making art out of — and thus changing — a border. To witness an environment in this way is not simply to observe it, but to question the fact of its existence with your own eyes and hands. There is no more authentic an engagement with the world. “The Gray Scale” is adapted from Monuments: 276 Views of the United States-Mexico Border, by David Taylor, which will be co-published this winter by Radius Books and the Nevada Museum of Art. William L. Fox is director of the Center for Art + Environment at the Nevada Museum of Art in Reno. Photographer David Taylor is a professor of art at the University of Arizona. Read more on Places from books published by Radius.